CLEARANCE -- Hurtta Padded Reflective Y-Harness for Dogs. This Neoprene-padded reflective harness is an ergonomic alternative to the collar. It also gives you an additional option for dogs that can't wear a traditional harness. 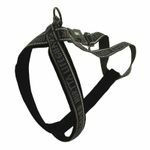 The harness design prevents load on your dog's neck and spine when pulling. Durable 3M reflectors increase visibility. Adjustable and waterproof.